for a job well done, a retirement, winning an award, memorialize a loved one or commemorate a historic place with a durable metal plaque. We are a re-sellers of these popular plaques that can be shipped just 8 working days after approval of the artwork. A variety of methods are used to manufacture these plaques – all using virgin materials of the purest alloys. Plaques can be made from lead and mercury free bronze, high-grade aluminum, lead-free brass, #304, or #316 stainless steel. A custom emblem or logo can be added to your plaque in two different ways; The plaque can be made with the emblem/logo as part of the plaque. Detail is somewhat limited by the manufacturing process. 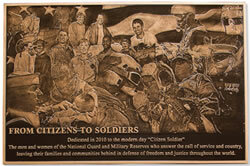 The second way is a separate etched piece attached to your plaque. This process has nearly no detail restrictions. However, additional charges will apply. The PhotoRelief™ method is different from other imaging techniques due to the actual sculpting of the photos into the base metal. In this way, it is similar to the Bas Relief without a sculptor’s interpretation of the image.